After losing the Class Painting Project to an Illustraitor in California in 2008, Rick worked with disgruntled Cadets who thought it was wrong to commission someone else to create their class painting and Copy everything Rick had created over the past 34 years. In turn, Rick created "Back in the Saddle". 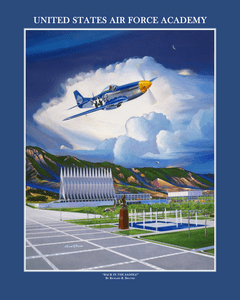 This beautiful painting showed an actual event where a P-51 flew over the Cadet Area in the early 1980's. Unfortunately, even with Legal Ramifications against the Artist from CA, and his local agent, we were not able to properly market the painting to the class. Only a handful of editions were sold.